Here we are back in Texas. The drive to Lubbock from Roswell, NM, took us past field after field of cotton. It always reminds us of snow as we look out across the fields. 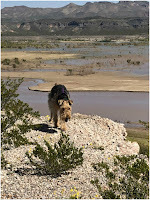 Loop 289 RV Park is where we stayed. 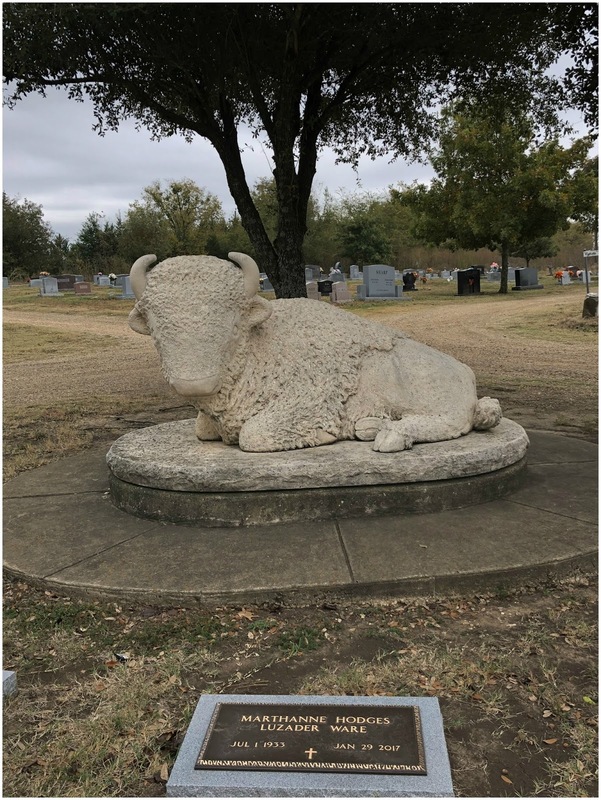 As the name suggests it is on the Hwy 289 Loop around town. There are close to a 100 sites, and the park is well maintained. It is mostly gravel with a little bit of grass. We were in site 14, a pull through that was just long enough for the RV and tow-dolly. The laundry room and bathrooms were very clean, they have a small lounge area next to the laundry with a TV and comfy chairs. The WiFi was poor, Verizon signal good. We paid $30 a night with a cash discount. Lubbuck is the birth place of Buddy Holly and where he was buried after dying in a plane crash in 1959. We visited the crash site in July 2015. 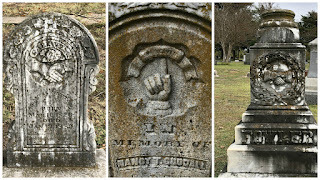 Finding his grave-site wasn't all that easy as the sign was missing when we drove into the cemetery. While we were making our final pass through, two guys were putting up the new sign, as someone stole the previous one! They pointed out the headstone and shared additional information with us. If you notice, his last name has an "e" in it. When he made his first record deal the contracts had his name misspelled and it stuck! 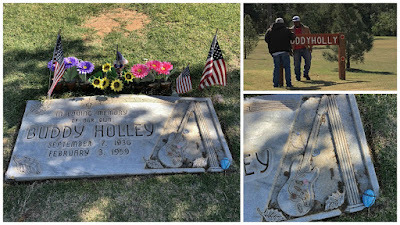 The angel is just a few feet away from Buddy Holly's grave. 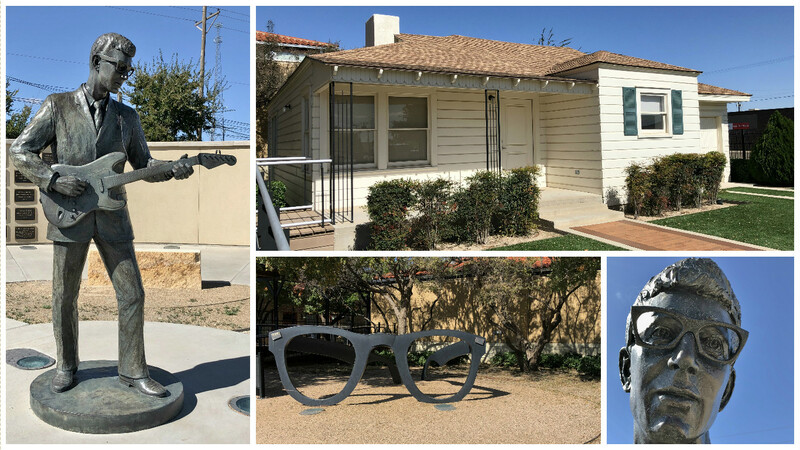 The Buddy Holly Center is in downtown. The house he grew up in has been moved to this location and across the street is a statue of Buddy on the Lubbock Walk of Fame. The house was located at 2215 6th Street and is where in 1956 the hit song "That'll Be The Day" was penned. 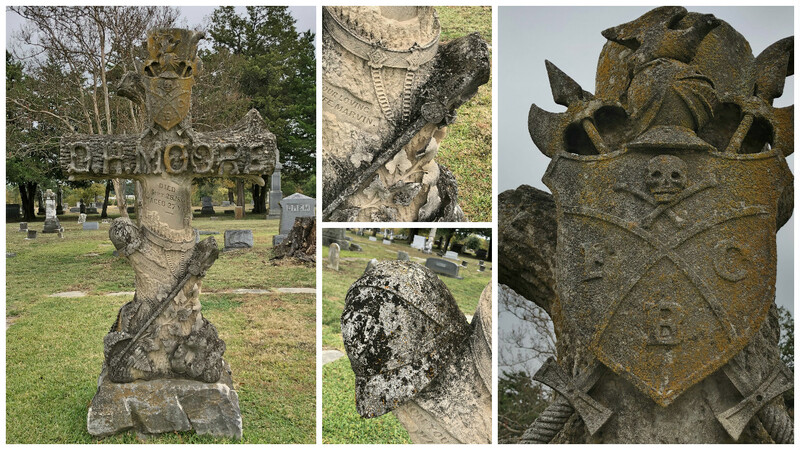 We found a few other Roadside Oddities. The American Wind Power Center has a number of windmills on site - we enjoyed the view of old and new. 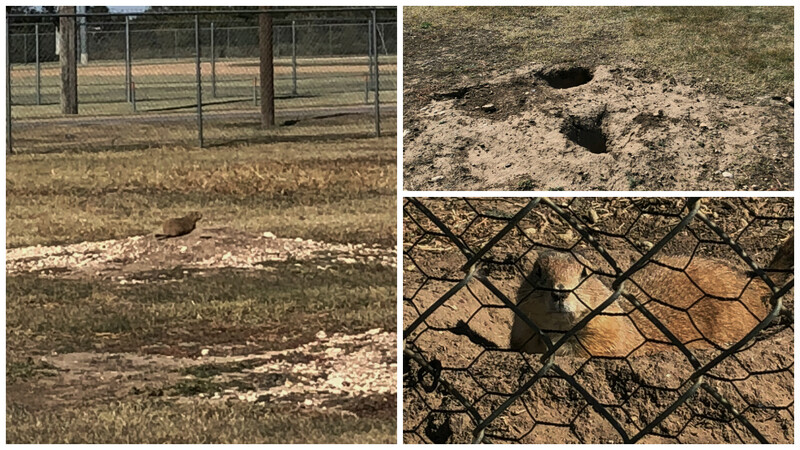 There is also a Prairie Dog Town here - a very large fenced in area for them. 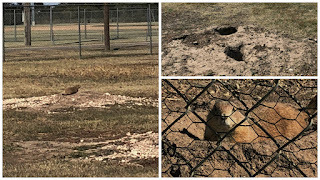 Not sure why they have a fence seeing they burrow under ground and the area outside the fence has a number of holes as well. 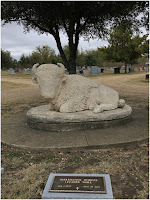 The Stubbs BBQ Memorial is at the site of the old Stubbs restaurant which was home to many musicians. Stubbs was known nationwide for his BBQ sauce and brisket marinade. Captain was hoping for some tasty BBQ but none was found. 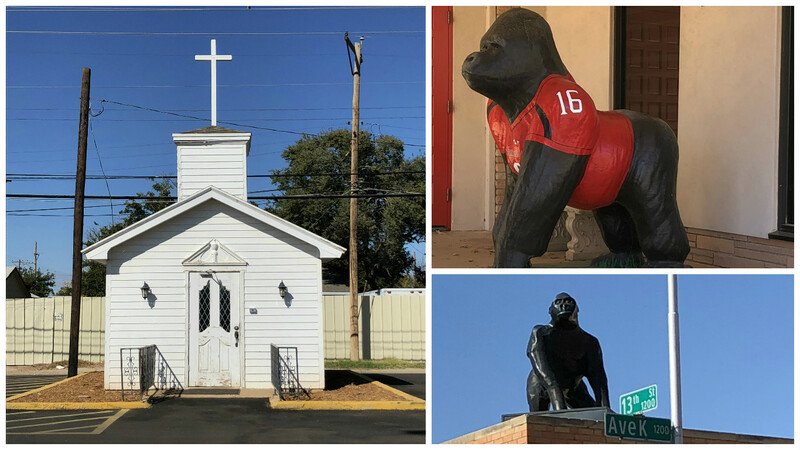 A personal injury lawyer has a couple of gorilla's hanging around his office, and the tiny chapel is actually a storage shed in the parking lot of a Baptist church. The Blarney Stone was another difficult one to find. It is on the campus of Texas Tech University. We stopped at two guard shacks and neither one knew what we were talking about. We did finally find it and Les, being the Irishman in the family got out to take the pictures and kiss the stone for some good luck. Maybe that's why he survived a heart attack! You might be wondering why there is a piece of the Blarney Stone here - well that is a good question. According to legend, the stone was discovered by a group of petroleum engineers while they were on a field trip. After testing, it was discovered that it was a piece of the original Blarney Stone. Can't argue with a legend. It is said that seniors that kiss the stone on graduation will receive the gift of eloquent speech. 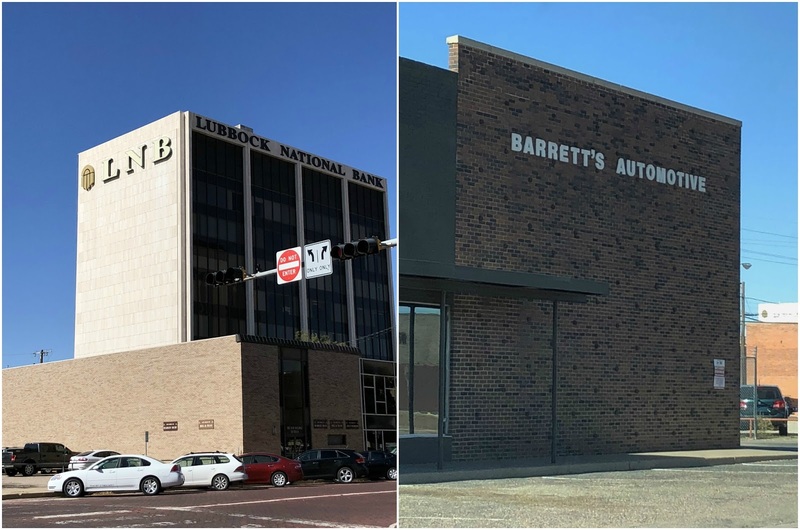 Even though it seems Lubbuck might be calling us here with our own automotive company and bank - we will have to decline the offer. There were no rolling hills on the drive to Wichita Falls, just flat land for as far as the eye can see. 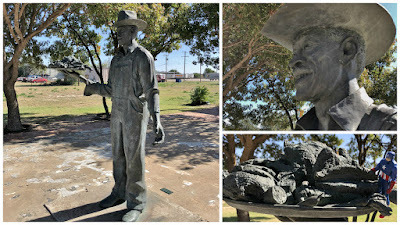 We arrived in Wichita Falls on October 31st. 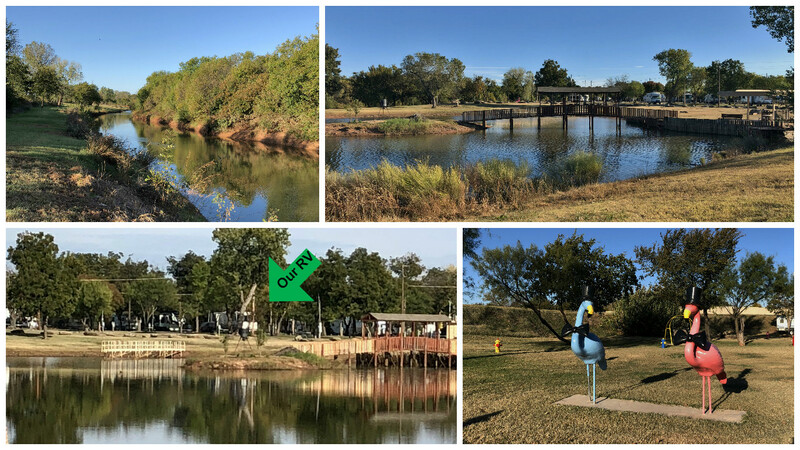 Wichita Falls RV Park sits on the Wichita River. They have 135 full hook up sites, we were in site 42, a very long gravel pull-thru with grass and shade trees. 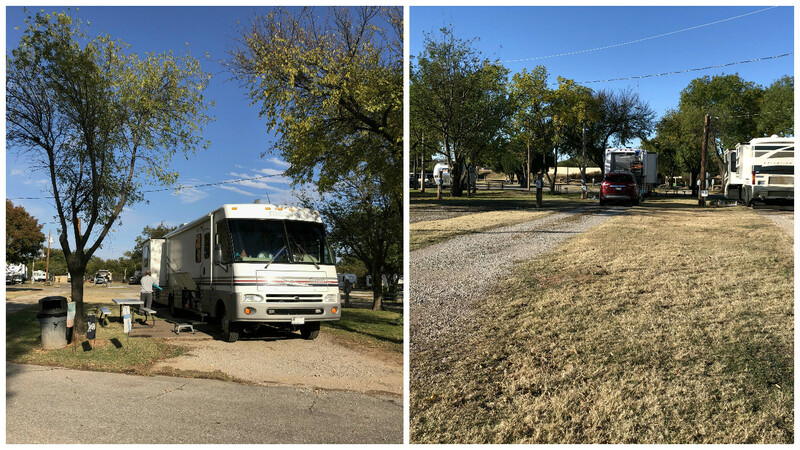 Two RV's could have fit on our site! The park is very well maintained, very quiet and also had a pond. There are two large dog walking areas. Laundry room was clean and Wifi worked fairly well. We paid $40.50 a night with our Good Sam discount. Mielikki loved our walks along the river, except when she wasn't allowed to chase down that squirrel, it may have turned her to drink. The World's Littlest Skyscraper was built in 1919 as part of a fraudulent investment scheme. When the proposal for money was made the investors didn't read the fine print as the measurements were listed as inches not feet. The building is 40' tall, 18' deep and 10' wide. The steep narrow interior stairways take up about 25% of the inside. The Newby-McMahon Building was quite the embarrassment to the city until it made it into Ripley's Believe It or Not. 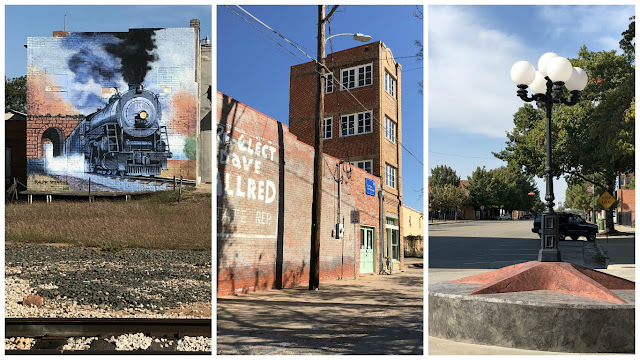 We loved the Train Mural and the bases of the street lights are metal stars. 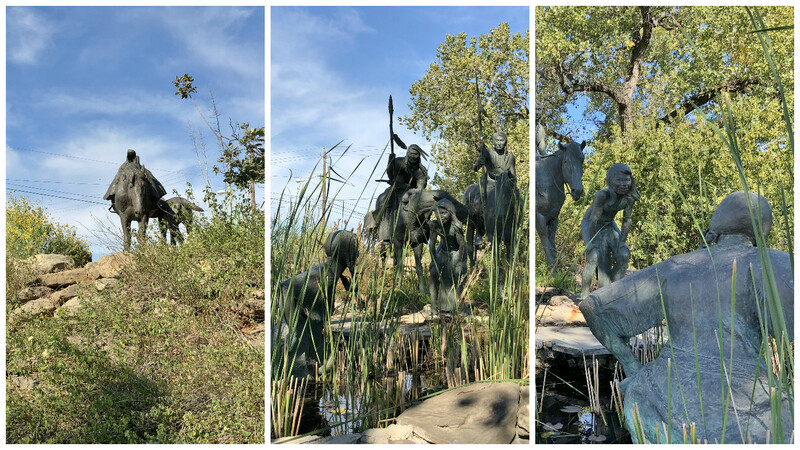 The Wee-Chi-Tah Sculpture features a Comanche family crossing the Wichita River. The multi-part piece of art is a Comanche women, her child, two braves, their horses and a colt. The legend of this crossing is where Wichita got its name. The woman is testing the rivers depth and describes it as "waist-deep" which is how "Wee-chi-tah" is translated. Our drive on November 2nd was pretty uneventful, can't really say that for this Fed-Ex driver - think those packages may be late. 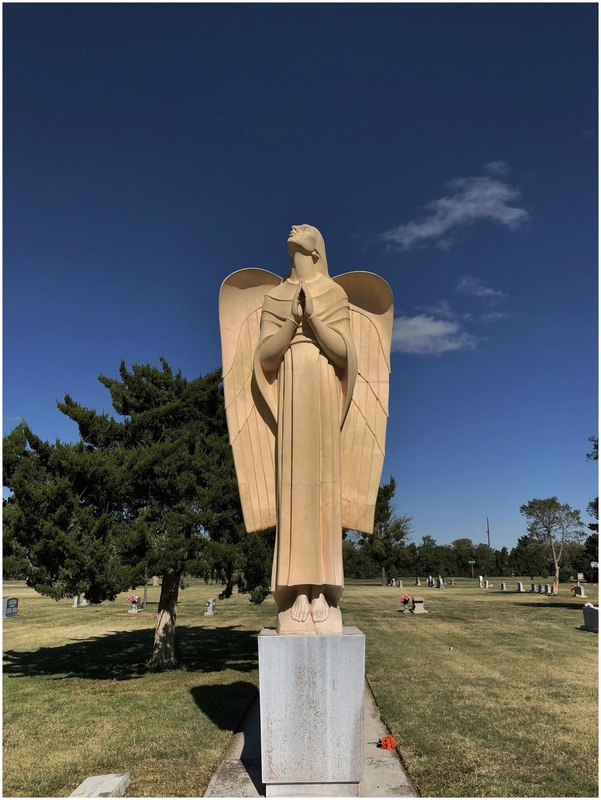 We have never been to Paris France but pretty sure it is nothing like Paris, TX, although they both have an Eiffel Tower. 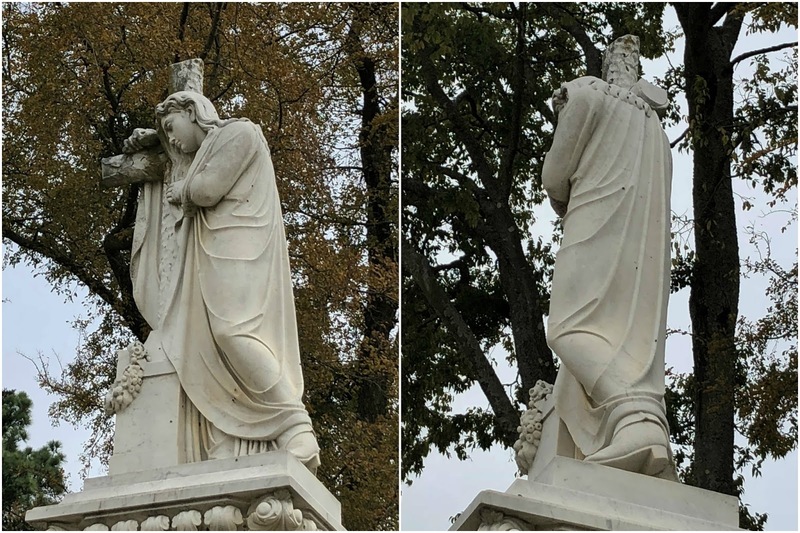 We are guessing the one in France does not have a giant cowboy hat on it. 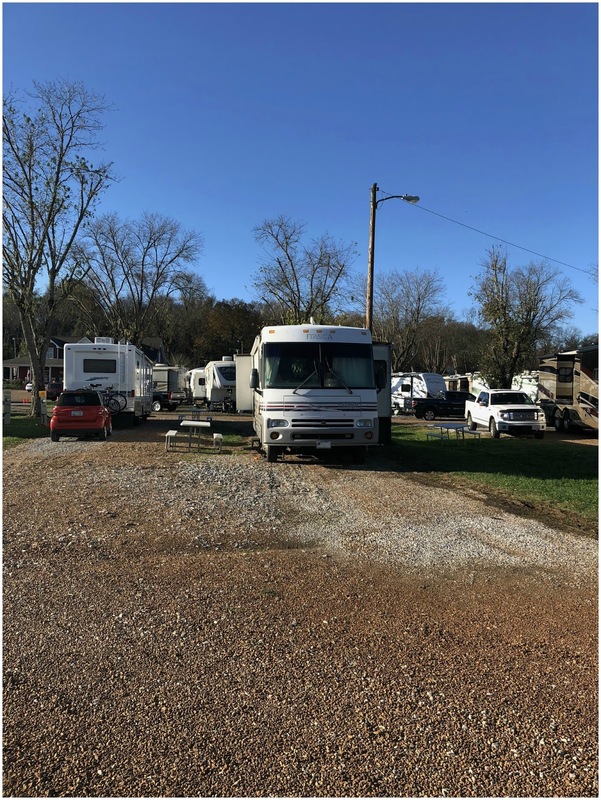 Spencer's RV Park is a park, repair shop and RV dealer all rolled into one. Most of the sites are filled with permanent residents with a few sites left open for over-nighters. It is fairly well maintained. The sites are narrow with full hook ups. Ours was barely long enough for the RV, tow-dolly and parking the car. Wifi was poor, the laundry room was just okay. We paid $30 a night with no discount. 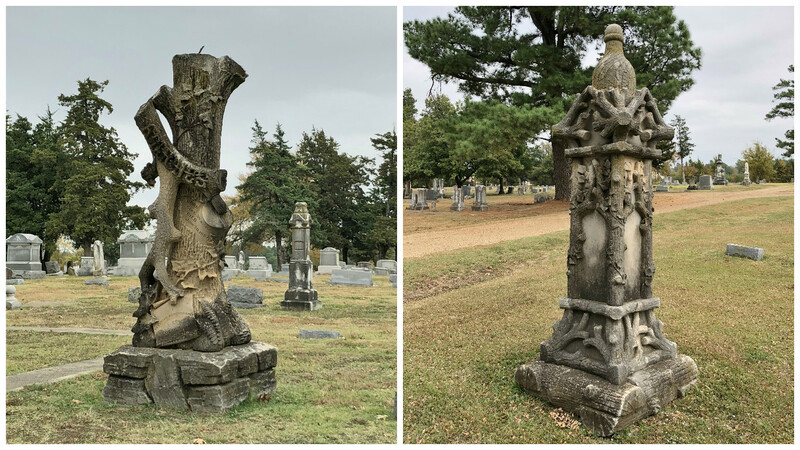 On our search for a grocery store and the Eiffel Tower we came across the Evergreen Cemetery. 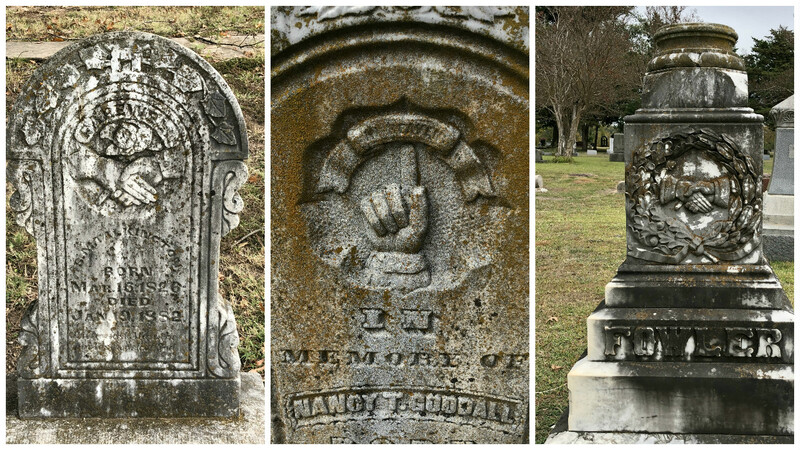 We found a number of old tombstones with hands, pointing up towards heaven and clasped ones. 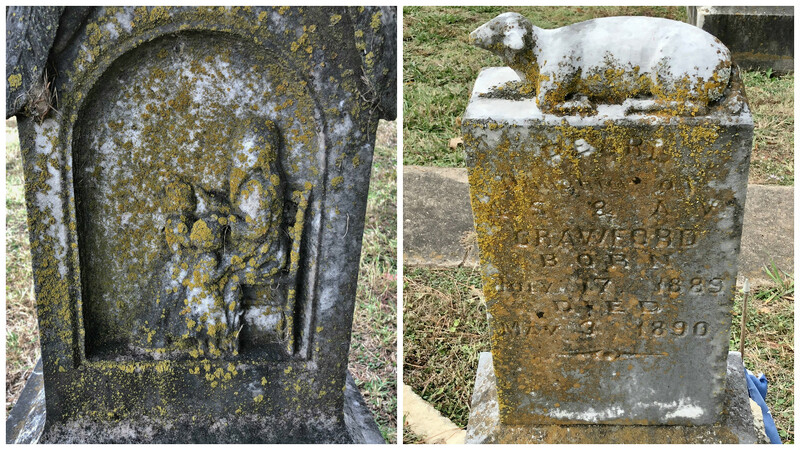 There were a number of lambs, which are usually on a young child's grave. One we had never seen before. A mother and child engraved on a pillar. 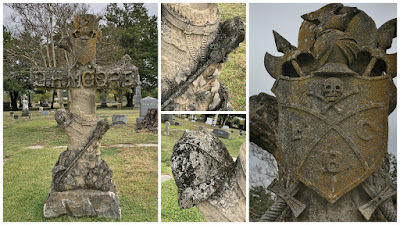 There were some beautiful pillars with trees on them and one that had a sword, helmet and a shield with cross and bones. The best one was Jesus wearing cowboy boots. The life sized buffalo was pretty interesting too. 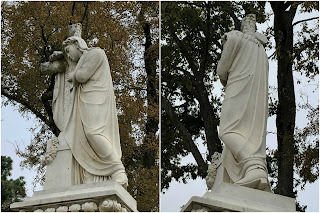 November 4th was the day we said good-bye to Paris and headed to Hot Springs, AR. 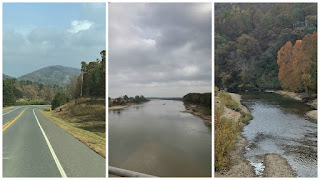 On the drive we saw some fall colors and crossed more rivers than we can remember. Our original plan was to stay here for a week, we came here from Little Rock in August 2016 and wanted a chance to explore it better. We wisely changed our plans to just two nights due to Les's health concerns. 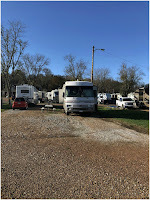 The Treasure Isle RV Park would be a great place to stay for a week. The park is well maintained and very quiet. 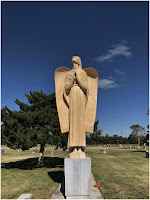 The sites are long and a little wider than normal. It sits on the Ouachita River which offers beautiful views and a great place for morning dog walks. Both mornings we watched large flocks of geese fly overhead. We paid $33 a night with a combination of Passport America and Good Sam Discounts. WiFi was decent, Verizon signal was good. Tom Sawyer's Mississippi River Park is where we headed on November 6. About halfway there we got a flat tire on the tow-dolly, so we had to pull off and change the tire. 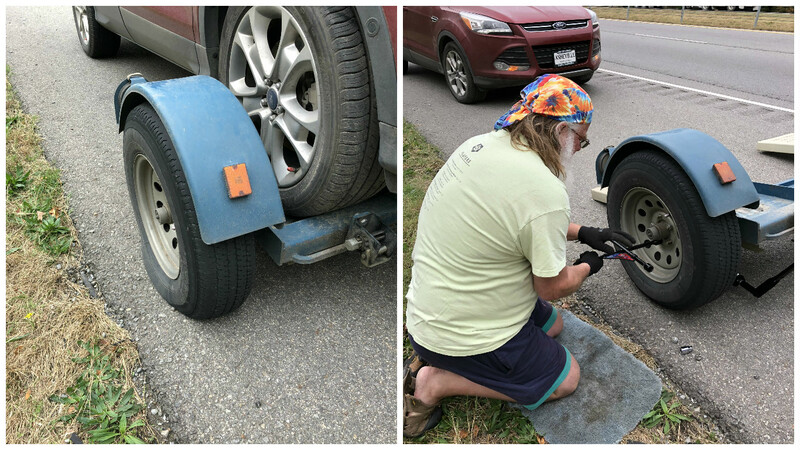 Nancy was very worried about Les doing this, but of course there was no stopping him and now that we know he actually had a heart attack in Cottonwood, we are very thankful he didn't have one on the side of the road! The road into the park takes you through an industrial area with train tracks and lots of trucks. We figured we were in for two nights of lots of noise. Luckily we were very wrong. The park is behind a raised embankment and a large wooded area so it was very quiet. 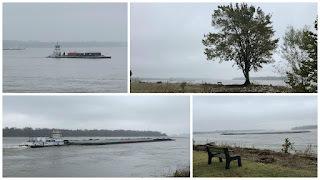 It sits right on the Mississippi River so the views were great. We got to watch many barges float down the river. They have benches along the rivers edges, each one also has a fire pit in front of it. There are miles of hiking trails through the park, along the river, around the lake and through the woods. 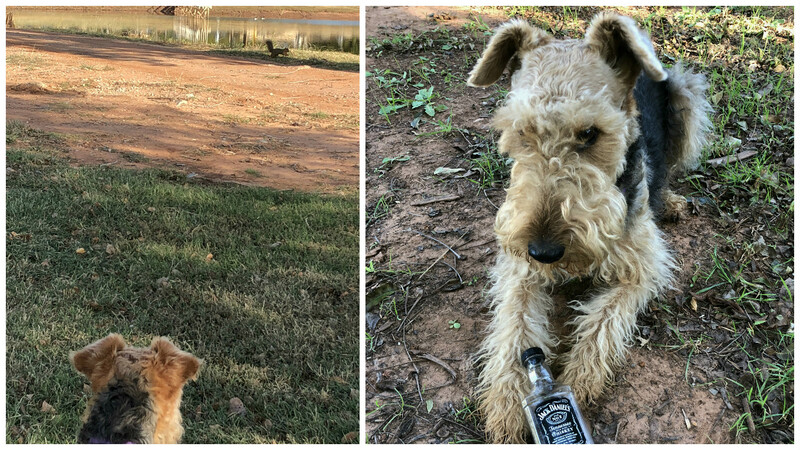 Mielikki loved her morning walks and runs. She found sticks and a football this time. Our site was a gravel pull through, long enough for the RV, tow-dolly and parking the car. The only downside to this park was the WiFi was spotty. We paid $35 a night with our Good Sam discount. 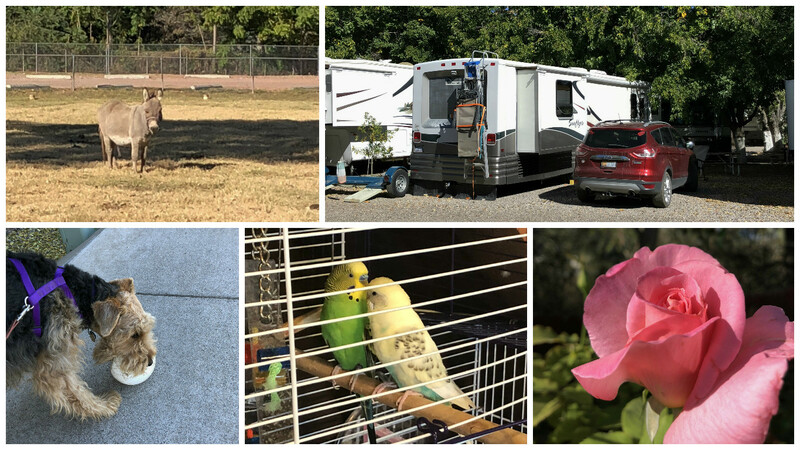 We always marvel at the different types of RV's and trailers we see. Like the people who live in them they come in all shapes and sizes. Our last stop before hitting Louisville. 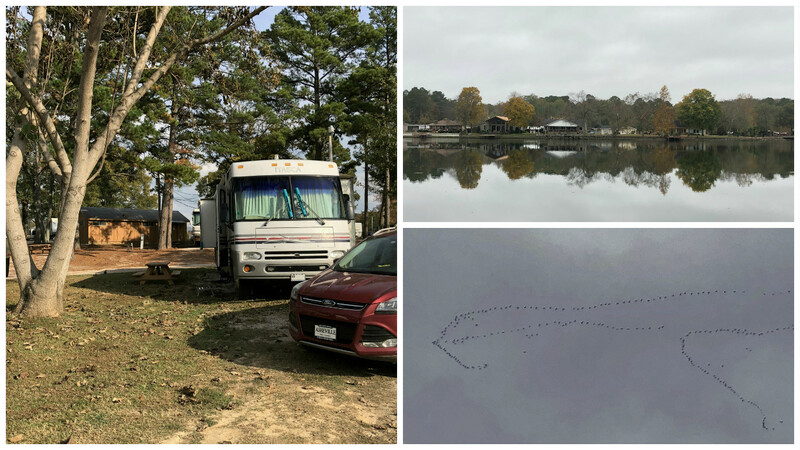 We arrived at the Grand Ole RV Resort on November 8th. Goodlettsville is just north of Nashville, TN. 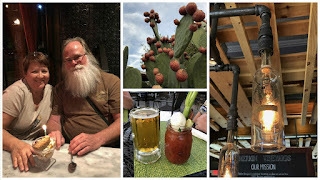 We had already been to Nashville so we didn't need to explore it again. In fact the car never came off the tow-dolly. This park is another example of using the word "resort" loosely. The park is well maintained but the sites are very narrow. Ours was long enough for us to fit but only a few feet from our neighbor. There is a fair amount of road noise and a train runs along the back of the park, luckily there is not always a train horn. The WiFi was poor, the laundry room was clean and they have a small store with basic needs. We paid $35.50 a night with a military discount. Louisville and Michigan are up next! ~ Invest in a spare tire. Our tow-dolly did not come with a spare. When we had to replace the tires we ordered a third one so we would have a spare. This not only saved us time on the trip to West Memphis it also saved us money. It would cost a whole lot more if road side assistance has to bring you a tire. 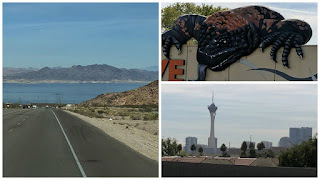 The drive on October 17, 2017 to Kingman, AZ took us through Las Vegas and past Lake Mead. We could see the "strip" off in the distance and this crazy creature was climbing over the wall of the expressway. This was another two night stop where we didn't unhook the car. In fact all of the next stops will be short stays. 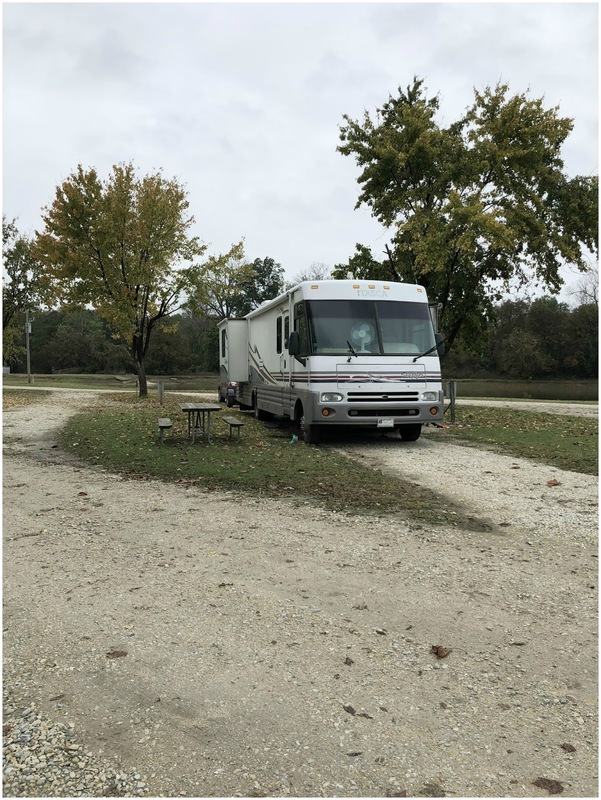 Our mission was to get to Louisville by the weekend before Thanksgiving, we will leave the RV and the dog with family there while we drive the car to Michigan to spend Thanksgiving with Katrina and Steve. More on that from Cottonwood. 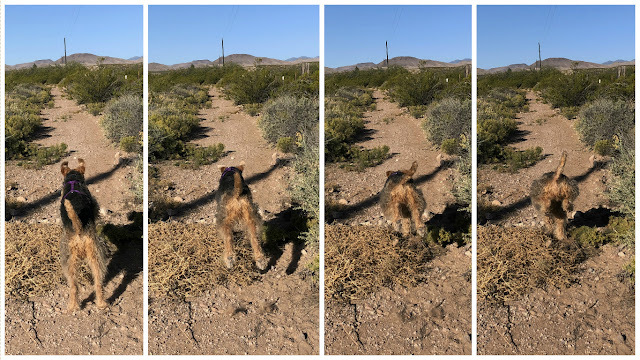 In January, we explored Kingman while driving Route 66 so there really wasn't much we hadn't seen. 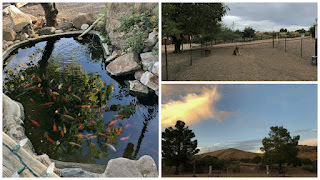 We stayed at the Blake Ranch RV Park. There are around 50 sites, a mix of back-in and pull-thru. Our site was a pull-thru with full hook-ups, plenty long enough and very level. Laundry room and bathrooms were very clean, WiFi was spotty. There are two large dog parks and the park is well maintained. They have a pretty gold fish pond in front of the office. The view from our site was very nice. We celebrated Les's birthday here with one of his favorite things - Dunkin Donuts was just a short walk away! This was an interesting stop. 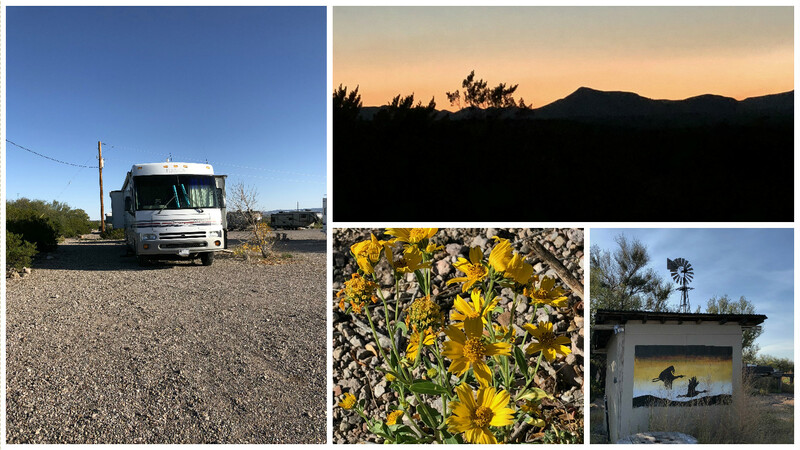 Turquoise Triangle RV Park was the first surprise. 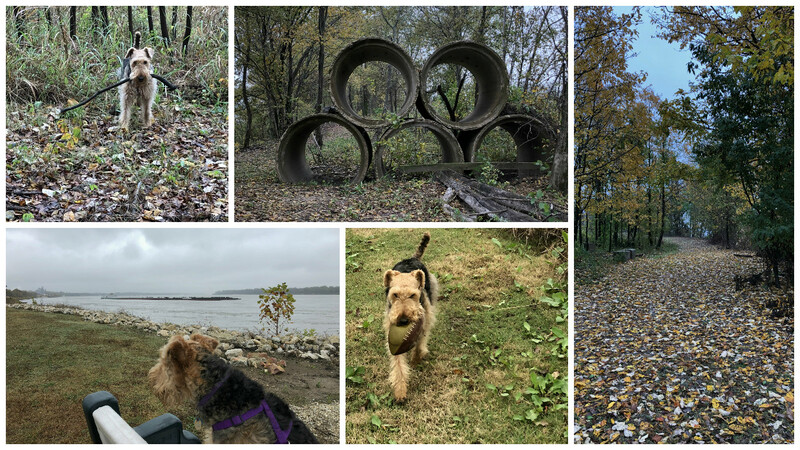 We arrived here on October 19, 2017 and we knew when the driveway was barely wide enough to pull into that we were in for a treat. We were greeted by two love birds when we checked in. This is small park, with about 90% of it full time residents. The few spots that are for over-nighters are very narrow buddy sites and very short. 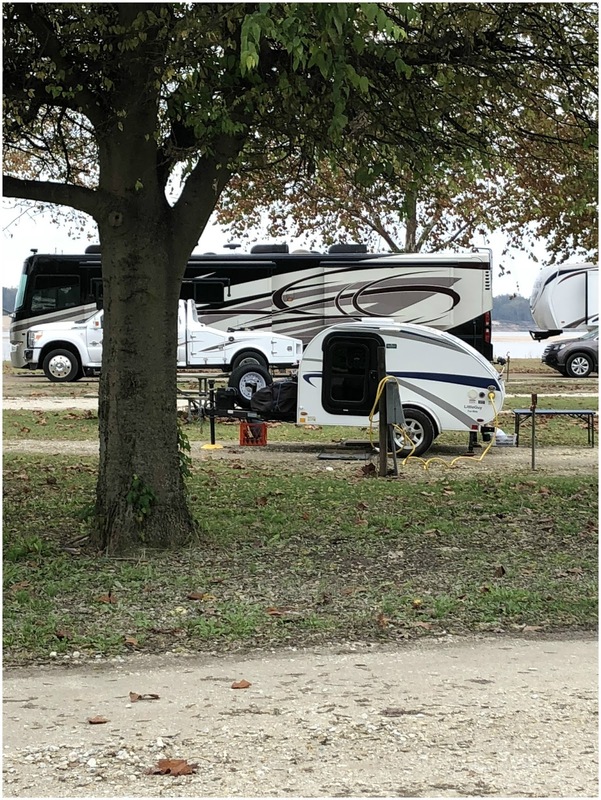 The RV just barely fit into the spot. Pretty sure the lady parked in front of us thought we were going to hit her RV! 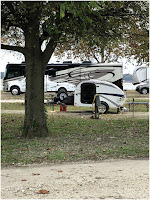 We had to maneuver the tow-dolly along one side of the RV and park the car on the other side. Luckily the people next to us were never there because we would not have been able to park two cars. The site was not level and the sewer hook up was broken. They did come and fix that right away. The WiFi didn't work. We paid $35 a night for all of this fun. Morning dog walks took place off site as there was nowhere on site to walk her, we met a donkey and found a ball that we brought home with us. Cottonwood is about 20 minutes south of Sedona and we got to explore it with Chuck and Gina (Nancy's nephew and his wife). There are a number of shops and art galleries along with restaurants and watering holes. We made a valiant attempt to hit them all. Les got to celebrate his birthday again. Chuck and Gina had to head back to Phoenix after breakfast on Saturday and our plan was to go to Sedona but we ended up in the local emergency room instead. Let's start with we are both fine. Les had not been feeling "just right" for a few days and Saturday was the worst. Short of breath and pressure and burning in his chest. 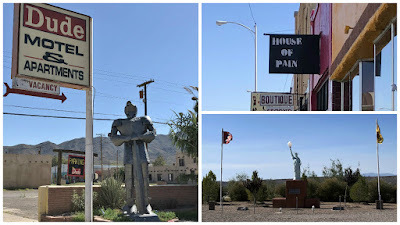 We were trying to decide if we should head to Prescott to go to the VA Hospital (hour and a half away) when the pains in his chest started getting worse and going into his arm. So off to ER we went. He did not have a heart attack - thank God. They are not really sure what was going on, his blood pressure was through the roof. They wanted him to stay so he could see a cardiologist, but agreed that going to the VA was okay. They supplied us with copies of all of the test results and we mailed them off to his doctor in Asheville. 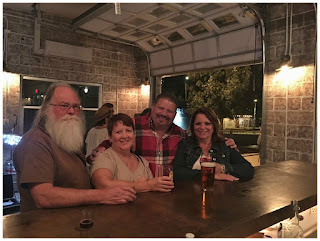 After talking with him we decided to stick to our plan and head to Louisville, shortening each stop to just two nights so we would arrive by the 10th. Les will go to the VA Hospital in Louisville to have additional tests run. He still tires very quickly but no additional severe chest pains. Nancy B - Best in class! 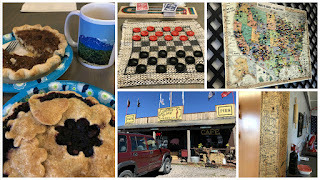 On our drive to St Johns on October 23, we made a stop at the Jack Rabbit Trading Post, in Joseph City, AZ. Nancy collects pins to put on her canvas art bag and we had bought a Jack Rabbit pin that looks like their sign on our last stop here. She lost it somewhere in Alaska so we stopped to get another one. Also while getting gas we had to chuckle at the perfect placement of these two trucks. We do find ourselves in some pretty small places and St Johns is one of them. 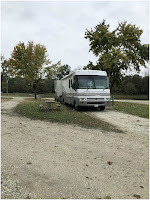 We stayed at the Moon Meadows RV Park. This park has seen better days, but for two nights it wasn't bad. There are a number of sites, most empty, some with full time residents. There is a mix of pull-through and back-in. We had a long pull-thru with full hook-ups. WiFi was poor but our Verizon signal was strong. We paid $20 a night with no discounts. 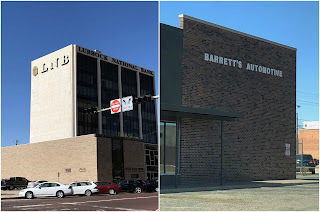 We did have to unhook the car here as we needed to mail the test results from the hospital to Les's doctor and there were unauthorized charges on our debit card so we needed to fax papers to the bank. One really nice thing about small towns is you can always find a great breakfast place. 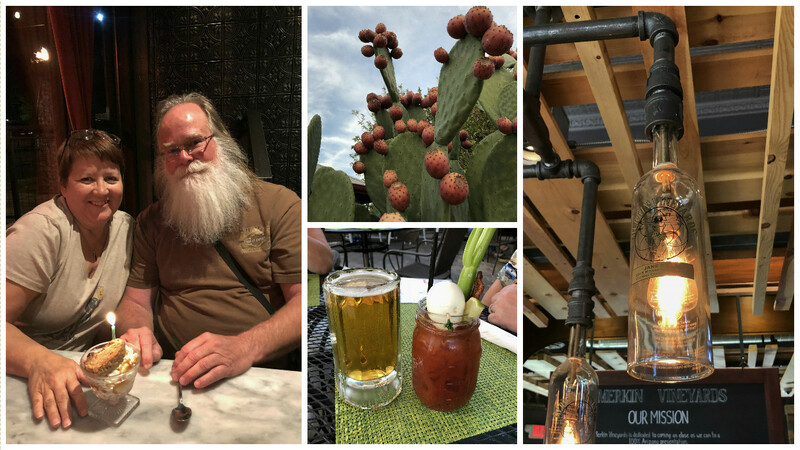 Tlc's Family Kitchen is the one in this town. 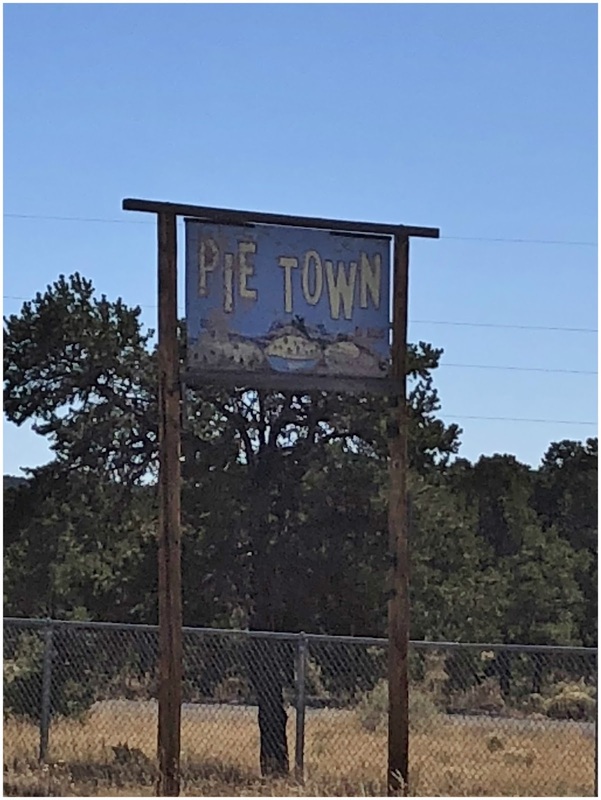 The drive on October 25 took us through Pie Town, NM. 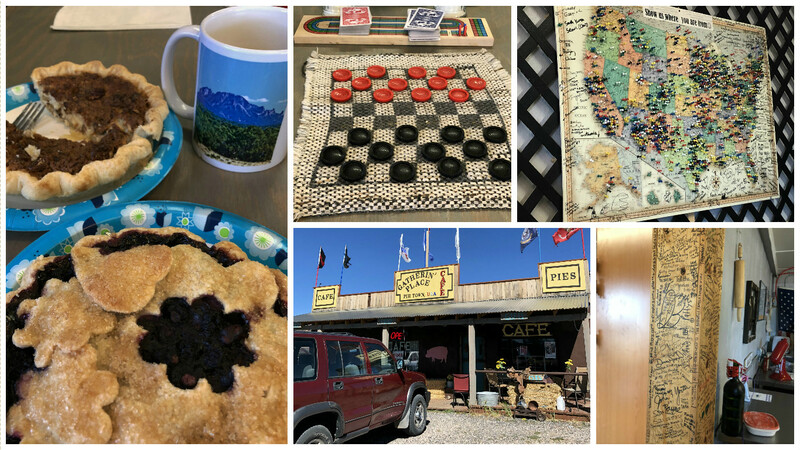 There is not much here except the Gatherin' Place Cafe that serves delicious pies. Of course we had to stop and try them. Pecan custard for Les and Blueberry for Nancy. 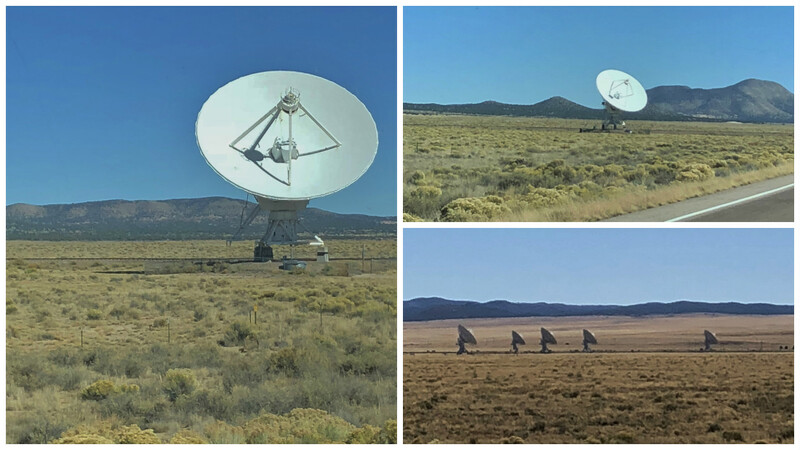 As we drove down Hwy 60 we could see the large satellite dishes from the Very Large Array, The National Radio Astronomy Observatory. They are so big you could see them from miles away. 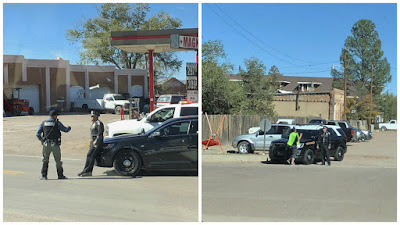 Then we had to take a detour from the highway in Magdalena as there appeared to be something going on downtown. The police had the road blocked and cars stationed along the detour. 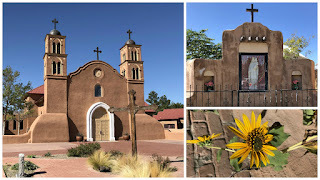 After all of that we arrived in San Antonio, NM, not to be confused with the one in Texas. This one is a very small town with a bar, general store and produce stand. 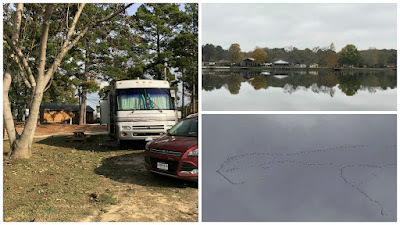 Bosque Birdwatchers RV Park was home for two nights. It is just outside of the Bosque del Apache National Wildlife Refuge and if it wasn't for the loud train it would have been very quiet here. There are around 20 sites, all gravel and a mix of 30 and 50 amp electric. 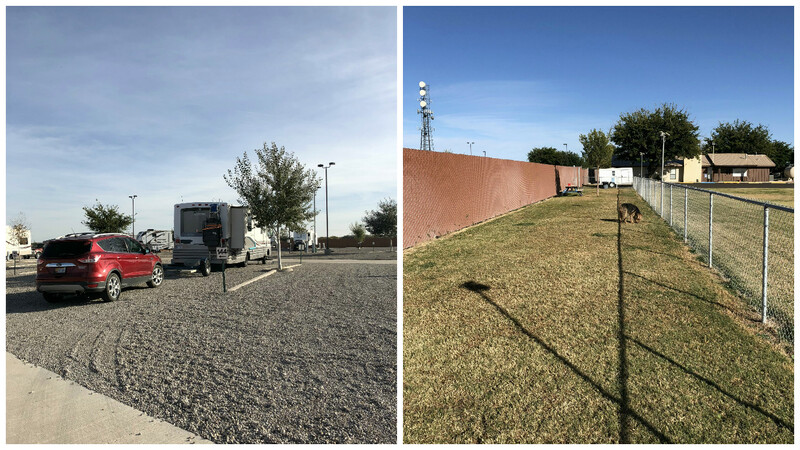 We were in Site 15, it was level and plenty long enough for the RV, tow-dolly and parking the car. We had full hookups, there is no WiFi and no laundry. There was lots of open space to let Mielikki run off lead. We paid $25 a night with no discounts. Truth or Consequences was just south of us so off we went. There is not much here to see but we love the name. 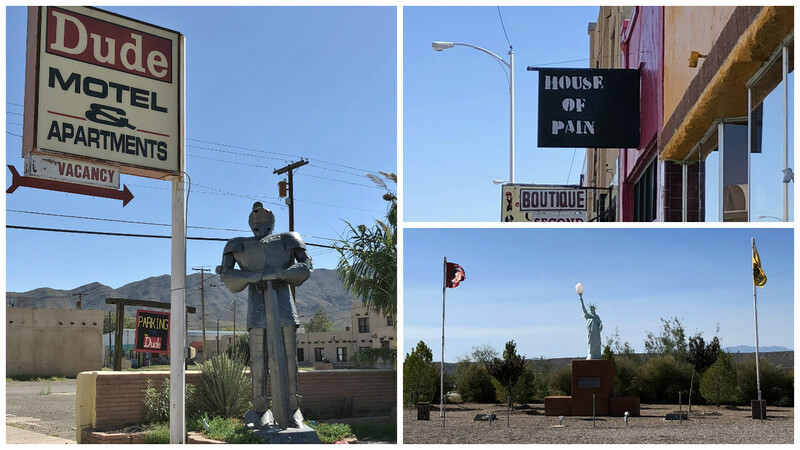 A Knight in Shinning Armor greets guests at the Dude Motel and the Statue of Liberty stands guard at the Veteran's Memorial. We were not brave enough to venture into the House of Pain! 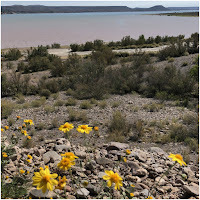 Elephant Butte State Park is just north of Truth or Consequences and we did enjoy our stop there. It is the largest state park in New Mexico. 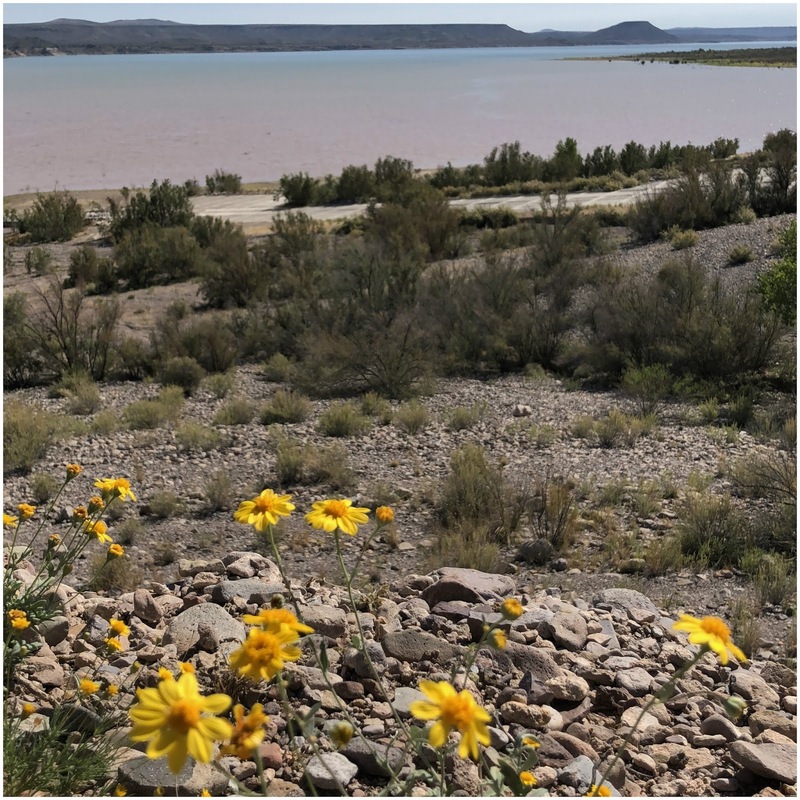 You can boat, fish and hike here. With Les not quite up to speed we enjoyed the views from one of the overlooks. Our departure was delayed a few hours due to needing a new tire. Les discovered a crack in the front passenger tire while doing his drive day check of the outside of the RV. Luckily, Socorro Tires in Socorro, just 15-minutes away had the tire we needed in stock. Once that was in place we hit the road. 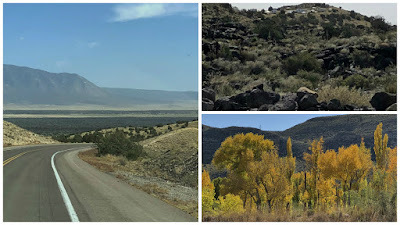 The drive on October 27, took us through a variety of scenery. Rolling hills, volcanic rock and a little bit of fall color. 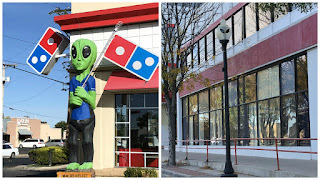 This was our second time visiting the Aliens. In February 2016 we stayed here for a week. This time we stayed at the Town and Country RV Park. 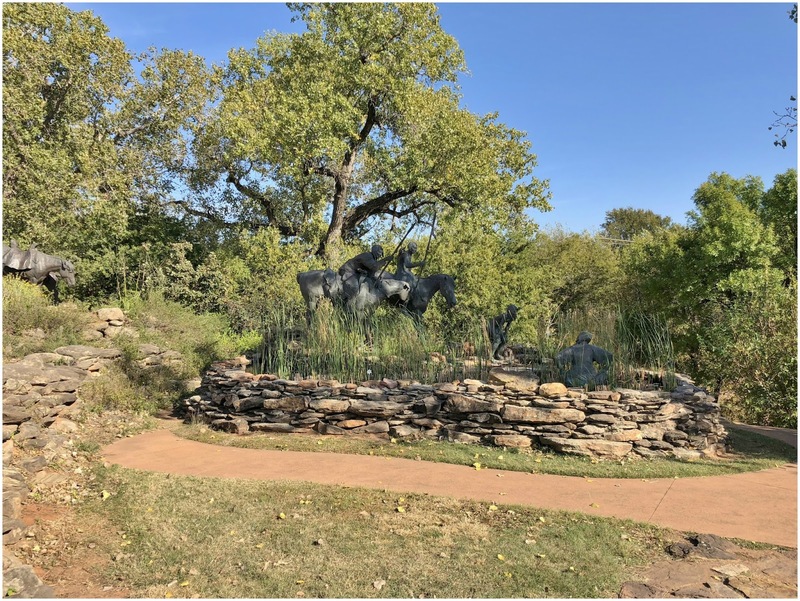 Large park and very well maintained. The back section, where we were is all gravel. The sites are long but on the narrow side. We had full-hooks and the WiFi actually worked. Nancy was so happy to be able to start getting caught up on the blog posts. They have a nice dog park, a pool and a clubhouse. 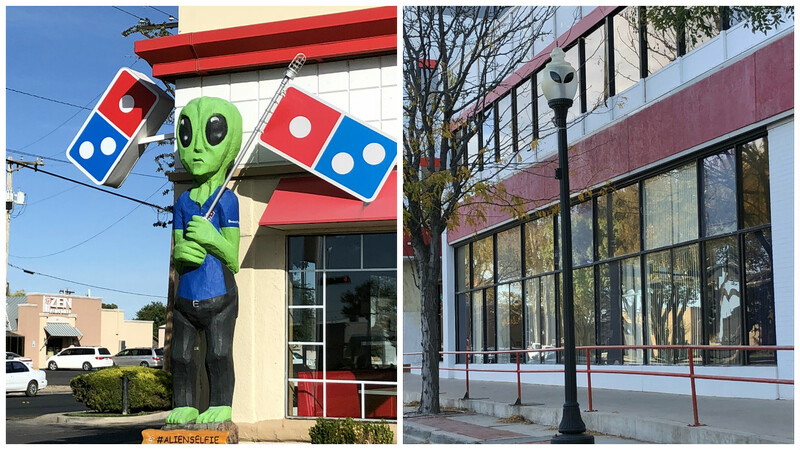 We did a little shopping in town, and once again somewhat disappointed in the lack of Alien stuff. Snapped a picture of a little green man, and we loved the "eyes" on the lamp shades. In a previous post we talked about Nancy's notebook that she keeps all of the campground information in as well as sights we want to see in the area. Her recommendation also included listing all of the local emergency information. Hospitals, both VA and regular, Urgent Care, and Veterinarians so if there should be an emergency we are prepared. 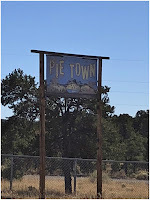 Well, over the course of time we have gotten a little lazy about this and at the stop in Cottonwood we did not have this information and it would have saved some frustration and a few minutes of time. Lesson learned!